The next step in human evolution continues to fascinate us and invite speculation. 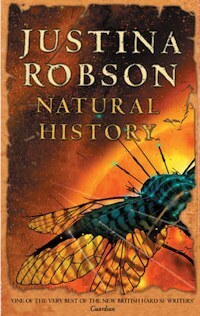 Natural History is Justina Robson's take on this subject. Humanity is divided between the Forged and the Unevolved, between those who have altered their bodies with MekTek or genetics, and those who have remained as "monkeys". The book opens with Voyager Lonestar Isol, one of the Forged, hurtling towards her death after colliding with an object in the depths of space. Only Isol isn't in a spaceship - she is the spaceship. Although officially human, the Forged are adapted for all sorts of environments, even the freezing vacuum of deep space. They can look like fish, birds, insects or entirely alien creatures, some living as jellyfish at the bottom of the sea whilst others inhabit the upper atmosphere. The price of these adaptations is high. Even though they may feel themselves to be physically superior to the Unevolved, the Forged still have many human passions and desires. Looking like a monster, or being the only Forged creature of your kind, isn't high on most people's wish lists. 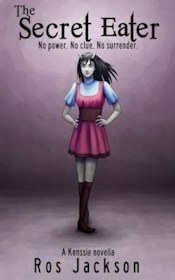 Isol, as her name suggests, is adapted to enjoy complete solitude as she explores the far reaches of space. After her deadly crash she discovers that she has made first contact, albeit with a dead alien that looks likely to kill her. Fortunately she encounters a substance that is capable of miraculously saving her life. This Stuff, as Isol calls it, is as mysterious and apparently inert as you can get. It's almost like solid lumps of magic, allowing Isol to travel faster than light merely by thinking about it. Although it is responsible for saving Isol that doesn't mean it is benevolent. It seems to be capable of doing anything at all in response to a strong enough wish, so who gets hold of it is a sensitive political issue. A black market for the distribution of Stuff soon emerges. Some of the Forged want to make Zia Di Notte, the planet near to where Isol found the Stuff, into a homeworld for the Forged. Zia Di Notte appears to have been abandoned by its inhabitants centuries before. But what happened to them, and why would they leave a perfectly good planet? Isol enlists the help of Zephyr Duquesne, a lecturer in ancient history, to discover more about it. Zephyr is Unevolved, and although Isol specifically requests her presence they don't get on at all well. Isol is intent on breaking away from the restrictions of Form and Function, the idea that the Forged are treated as mere tools of humans because they are created to perform a specific job. This inequity is shown at its worst with the Gaiaforms, Forged creatures who have been put in permanent suspended animation because after terraforming in the solar system there was nowhere left for them to go. Inactivity makes them sick, so if they were simply retired somewhere they would die. Form and Function is a political hot cake. Natural History is far more complex than this summary would imply, and is often baffling. It introduces a lot of concepts early on, and it's not clear where it will all lead. For example, the Forged spend a lot of time in Uluru, a sort of advanced virtual reality that most of the Unevolved are not equipped to enjoy. But what has that got to do with the rest of the plot? Whilst you're working out the answer to that question, Justina Robson brings in more themes for the reader to contend with, everything from politics and piracy to M-theory and the nature of the self. "A quark-gluon plasma, or certain other forms of essential quantum instability, focused on a reasonably tight region can disperse us irretrievably if directed at us in our Four-D manifestation." There are quite a few sentences similar to the one above, particularly towards the end of the book. If you're comfortable with that kind of language you'll get more out of this story, but it can certainly be heavy going in parts. Natural History is undeniably richly imagined, but it tends to overreach itself by dealing with too many themes and too much science at once. You end up caring about Zephyr and Tom Corvax as they deal with the unknown and face the possibility of death, although some of the characters, such as the sly Gritter and the frosty Isol, are harder to sympathise with. It's a future populated with a large variety of characters of different personalities and body shapes, but this tends towards hard, conceptual science fiction rather than space opera, and it's something you would read more for the ideas than anything else. This is a highbrow read which can be demanding, but also rewarding if you're prepared to give it your full concentration. This is the epic story of the primates, as they evolve from tiny mammals into the humans who would shape and dominate the world, and beyond. In Botanica, life under the great Tree is all they know. What will a young woman learn as she journeys around it?